My set of Field Notes notebooks finally arrived on Monday. Now let’s skip the review part and get straight to the “Why I unabashedly love Field Notes” part. Details. I could be wrong but you will not find notebooks in Wal-Mart with this many little details. And it’s the details that make these not only great, but especially appealing to creative-types. The back inside cover features a “Specifications” heading with all the details of the first run. They are details only a designer could love, but they are there. Plus, “FIELD NOTES only uses the Futura typeface family (Paul Renner, 1927) in its materials.” Let’s hear it for Futura. Said back inside cover also features a bit about the inspiration behind Field Notes, a few practical applications (my favorite being “Shady Transactions”) and a 5-inch ruler printed along the edge. These little things take what could be a mundane product (honestly, it’s a friggin’ note pad) and make them fun every time you thumb through them. So far I’ve used the notebooks in a few meetings and love them. They are the perfect size to fit in my back pocket and seem durable enough to withstand the beating of daily use. They are good for meetings where I don’t want to lug a laptop or a giant yellow notepad. I’ve also used the ruler more than once because I keep a notebook on my desk and it’s easier to crack it open and measure than to dig through the drawer to find a real ruler. They are also great for concepting. Whenever I’m working on a new design I rarely sit down in front of my computer. Usually I start with a pencil and a piece of paper. This generally means I have tons of concept papers floating around the office. Field Notes allows me to keep everything in one convenient package. The other thing I’ve noticed is that my hand writing is really bad. I need to work on that. The CP sticker is probably going on my truck right across from the Apple sticker to balance out the creative vibe. 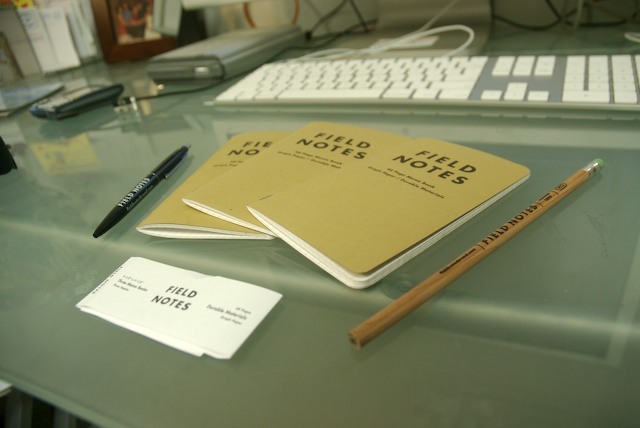 You can order Field Notes Brand notebooks here and I’d recommend you do so if you have ever found yourself geeking out about little design details. Seriously, they don’t sell notebooks at Wally World? That’s the problem. I get it now…I think. 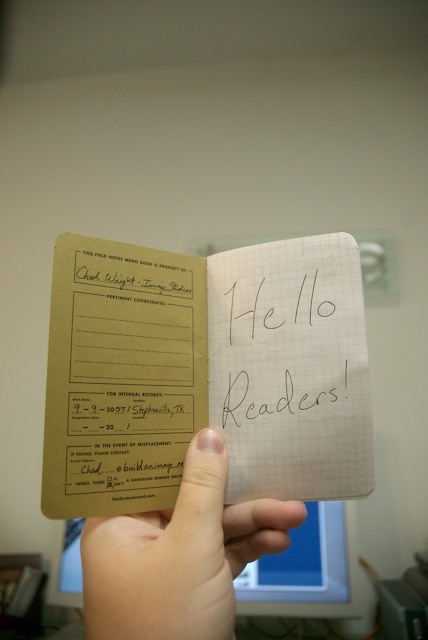 I just “discovered” field notebooks and thanks to the wonder of the “googler” I stumbled across your review. And guess what? I’m going to order some, right about now. I’m more than happy to pay extra for products that are well thought out and well designed. so Matt, what do YOU recommend?